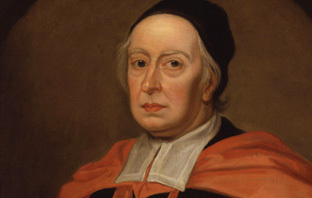 John Wallis (1616–1703) is best known to early modern intellectual historians and fans of Cultures of Knowledge as an archetypal Republic of Letters polymath; Oxford’s Savilian Professor of Geometry, a gifted cryptographer, and keeper of the University Archives who corresponded extensively with the leading continental luminaries of the age. The letters reproduced in Volume IV of The Correspondence of John Wallis (OUP), to which our Research Fellow Philip Beeley is putting the finishing touches, largely reinforce this impression. The missives find the mathematician embroiled in abstruse conversations with Francis Jessop, Christiaan Huygens, Rasmus Bartholin, and Leibniz about methods of tangents, the rectification of the cycloid, and the reinvigoration of scientific meetings at the Royal Society. However, I was intrigued when Philip told me that many of the letters in this volume reveal that in early 1674 Wallis was sucked into an epistolary controversy of an altogether more worldly kind: a bitter dispute over an Oxford tavern. As an erstwhile historian of early modern intoxicants – a lively and growing field – I found this run of letters fascinating, and I am extremely grateful to Philip and Keeper of the University Archives Simon Bailey for letting me write about them, and also to reproduce some manuscripts and transcriptions, on the blog (and I hope regular readers will forgive this bibulous tangent, or epistolary detour into drink).1 This is not the first analytical splicing of letters and liquor, and there are many well-known touch points between seventeenth-century drinking houses and learned correspondence, including (to name just a few) the role of inns and their keepers as nodes within postal systems; the consumption, oral dissemination, and scribal circulation of letters within drinking places; and the superimposition of manuscript correspondence networks upon a daily round of face to face exchange of ideas and information – an oral story world, in Sophie van Romburgh’s memorable phrase – traversing the material and social spaces of streets, dwellings, coffee houses, taverns, alehouses, inns, brandy shops, and punch houses as well as libraries and laboratories. As such, some relevant keyword searches in Early Modern Letters Online yield riches for the historian of drinking. However, the vignette below illustrates the cross-fertilization of worlds with an unusual vividness. Detail from Tavern Scene, by David Teniers. 1658 (National Gallery of Art, Washington DC [Wikimedia Commons]). The saga began in the early 1670s when, to remedy a shortfall in revenues, Charles II and the Treasury instructed the commissioners of the Wine Licence Office in London to review the number of taverns with a view to increasing their number – and hence the value of import duties and wine rents paid directly to the crown – across the realm (unlike more humble alehouses, licensed at the county or borough level, taverns – specialist retail outlets for wine – had since an act of 1553 been licensed centrally by royal representatives).2 Provision in Oxford came under the microscope in late 1673, when it was discovered that this thriving urban community was still limited to the three taverns it had originally been granted under the terms of the 1553 act, which capped the number of wine outlets within each city. This no doubt struck the commissioners as a terrible missed opportunity given the appetite for fashionable grape varieties amongst the wealthy scions and scholars of university towns (for comparison, it was the same number of wine houses as operated within the down at heel Solent port of Southampton). The Wine Licence Office, in conjunction with the town’s civic governors – but without consulting the University – thus licensed another young vintner called William Stirk (fresh out of a tavern apprenticeship) to retail wine from his premises near Holywell Street, a plum spot in central Oxford within striking distance of the Bodleian Library.3 At some point in March 1674, Oxford’s fourth and newest tavern put up its sign and opened for business. 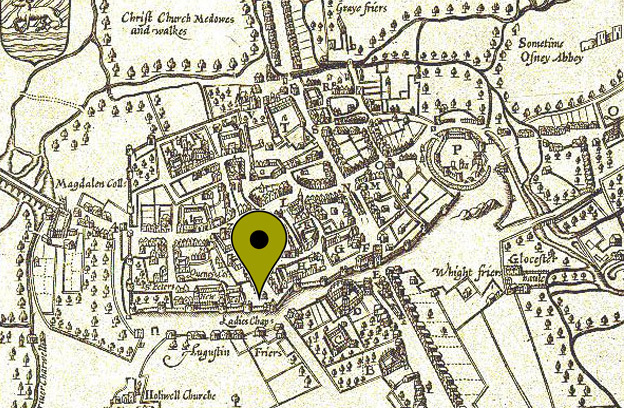 Drinking Geographies: John Speed’s 1605 map of Oxford, with the approximate location of William Stirk’s tavern indicated. Sourced from Wikimedia Commons. Plum Spot: Stirk’s tavern would not have been located far away from the present-day King’s Arms. Scourge of Vintners: Vice Chancellor Ralph Bathurst, the theologian and physician who led the initial campaign against Stirk’s tavern. Opening Gambit: The first letter from the Wine Licence Office to Vice Chancellor Bathurst, defending their actions and complaining about the University’s treatment of Stirk. Oxford University Archives, WPBeta/15/8, No. 1.
Who You Gonna Call? Tavern-buster John Wallis. With the dispute spiralling and now facing legal action, the University invoked their secret weapon; as Bathurst described him, ‘Dr Wallis, one of our public professors, and custus archivorum’.8 Thus began Wallis’s involvement in the affair. The choice of one of the architects of infinitesimal calculus – who Bathurst later described as ‘our agent’ – to spearhead the University’s case against the upstart tavern is less surprising than it might at first appear. 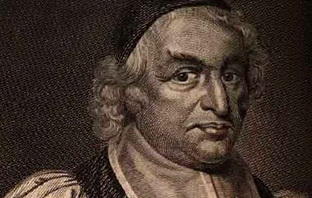 The mathematician was revered as one of the finest analytical minds of his generation, and also had noted skills as a rhetorician, not least due to his celebrated contributions as a correspondent. Woven deeply into Oxford’s institutional fabric by means of his Savilian chair of geometry, he had also earned a reputation for dogged loyalty (as Bathurst put it, he is a ‘true friend of universities’),9 while his role as keeper of the university archives put him within fingertip reach of the stacks of precedent-rich documents that would be needed to make the case. For his part, notwithstanding his manifold commitments to higher learning and the global Republic of Letters, Wallis – no great frequenter of drinking places himself – clearly welcomed another opportunity to further ingratiate himself with the University brass, and threw himself enthusiastically into his newly appointed role as tavern-buster. His first and main task was to draw up a ‘breviary’ entitled ‘The Case of the Vintners in Oxford, 1674’ (pdf); ready by May 8, this detailed compendium of relevant legislation and legal precedents involved Wallis in an extensive paper-chase through the statute books and the administrative archives of both Oxford and Cambridge, and exists in several manuscript versions in various hands, one of which was send to the Chancellor, and another to the Lord Treasurer at the Exchequer of Pleas who would be deciding the case.10 In this key document, Wallis sets out a strong common law defence for the University, focusing for the most part on Oxonian and Cantabrigian test cases where the sole right of University officers to licence and suppress taverns was upheld by the courts. 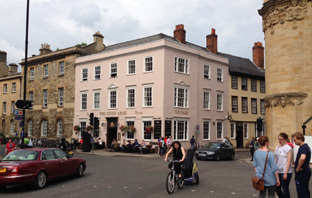 This includes the interesting case of John Keymer’s tavern in Cambridge in the late sixteenth century; licensed by collector of wine rents Sir Walter Raleigh in defiance of that University’s wishes, this was shut down at the behest of the Privy Council when the proctors complained that their jurisdiction was ‘molested’ (the campaign of terror waged against Keymer and his wife, described in his ODNB entry, is probably similar to that experienced by the star-crossed Stirk). It also summarises the local cases of ‘Mr Alderman Potter’ (a wool-draper and rogue taverner squashed by the Vice Chancellor in 1620), and of ‘Mrs Turton’ (a town-licensed tavern-keeper suppressed at the behest of the University in 1661). After several pages of careful documentary proofs Wallis’s conclusion was brief but devastating: ‘[T]he present New Tavern… erected by license from the Wine Office, is manifestly destructive to our Rights’. 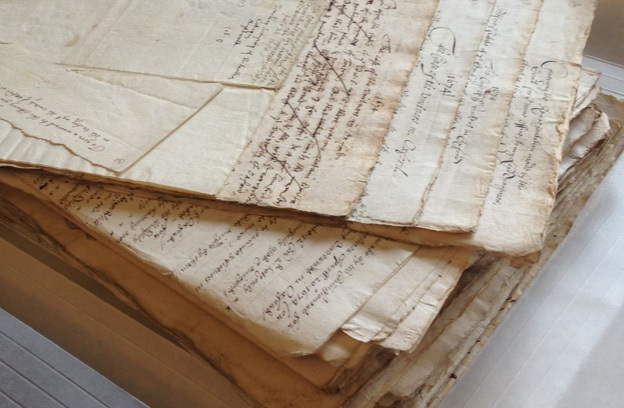 Documenting Drink: Four scribal copies of ‘The Case of the Vintners in Oxford, 1674’ (with Wallis’s original draft uppermost), pictured on top of the stacks of documents Wallis used in preparing his case. Foot Dragging: Detail from the Wine Licence Office’s January 1675 letter to Bathurst, complaining about the University’s ‘further severity against Mr Stirk’ and urging them to cease harassment until the oft-delayed hearing before the Lord Treasurer at the Exchequer of Pleas. Oxford University Archives, WPBeta/15/8, No. 8. 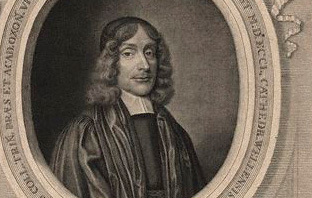 Friends in High Places: Peter Mews, former Oxford Vice Chancellor and Bishop of Bath and Wells, whose intervention brought a swift resolution to the case. 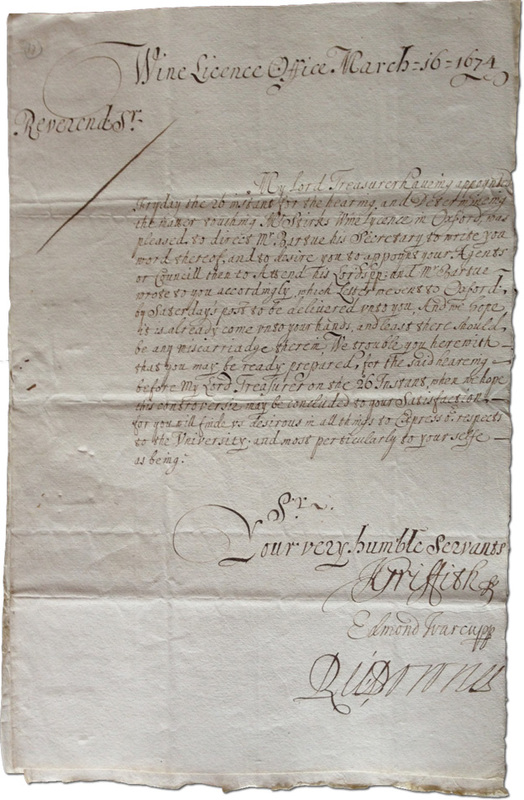 After nearly a year of ‘tedious, chargeable, and fruitless attention’, and several unanswered epistolary Exocets to London clerks on the part of Wallis, the enterprising mathematician wheeled out the big guns in a letter dated 16 March 1674/5, and sent to Peter Mews at his Charing Cross lodgings; Mews was not only Bathurst’s immediate predecessor as Vice Chancellor, but – more usefully for the embattled Oxonian tavern-busters – was by now the high-ranking Bishop of Bath and Wells. 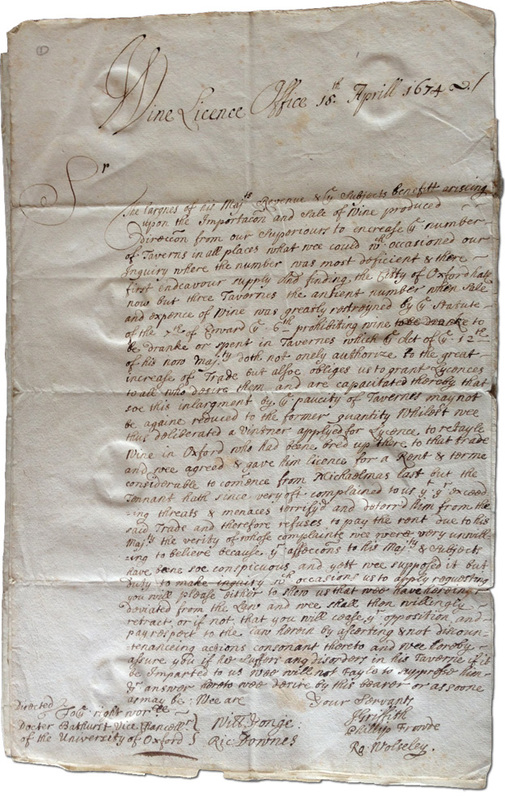 In this lengthy document, Wallis complains in vigorous terms about ‘the tavern… sett up to confront us’, and also about the stalling of the case on the part of the Wine Licence Office, the Exchequer of Pleas, and the Lord Treasurer.13 Mews replied to Wallis modestly (‘You may assure your selfe of my utmost endeavers to serve the University so far as my small interest in those Persons who are concern’d may be usefull’),14 but his intervention had a swift and decisive effect, for that very same day – 16 March 1674/5 – the London wine commissioners mailed to Bathurst an extremely conciliatory, almost obsequious response. Within it, they referred to a letter they had sent to him confirming a date for a hearing (set for 26 April), ‘which letter we sent to Oxford by Saturday’s post to be delivered unto you’.15 We know from Wallis’s letter to Mews that this missive was indeed received by Bathurst on the Saturday in question (‘Mr Vice-chancellor having last Saturday, received summons…’), providing further evidence of the speed and efficiency of the Oxford-London postal axis in this period, especially when galvanized by disputed drinking places. The Speed of the Post: The Wine Licence Office’s final letter to Vice Chancellor Bathurst, setting a date for the hearing, and containing some information about the efficiency of the Oxford-London epistolary axis. Oxford University Archives, WPBeta/15/8, No. 11. The writing was on the wall as well as on the parchment; the hearing, which seems to have finally taken place over two days between 28 April and 5 May 1675, found in favour of the University, and Stirk – another high-profile vintner scalp for an early modern Vice Chancellor – was officially discharged of his licence and finally closed for business in June.16 However, regardless of this somewhat predicable result, some more general conclusions emerge from this bibulous case study. From the perspective of the historian of alcohol, it offers a fascinating insight into the workings of the wine trade in the unique, if not entirely representative, setting of a University city;17 indeed, even if the situation sketched here is far from typical, it offers a reminder of the importance of local frameworks in structuring drinking landscapes, of the close yet highly contested relationship between central and local authorities and apparatuses in the regulation of alcohol, and in particular of the almost unique capacity of early modern intoxicants to engender and crystallize turf wars over jurisdictional privilege that reached far beyond tavern walls (something I have argued in a different context elsewhere).18 And from the perspective of correspondence networks and the great worldwide sweep of the Republic of Letters – specifically, through the instrumentality of John Wallis to the successful pursuit and resolution of the case – it reminds us that the life of the mind in early modern Europe was not abstract or free-floating, that scholarly correspondents were embedded in complex life-worlds (especially when, as was so often the case, they were required to wear so many different hats), and that there was perhaps no such thing as a ‘learned correspondence’, hermetically sealed from seepage from the quotidian and the everyday. This entry was posted in Letters in Focus, Project Updates, Publications on June 21, 2013 by James Brown.